Amongst the 1,000's of surge protector available on the market what makes this one so special. The problem with a gang plug surge protector is when either putting or removing a plug the protector always wants to move. The unique patent has 4 adjusting screws that locate in the back of the protector to make it fast and secure whether its an industrial plug (which extrudes quite a bit from the wall) or a conventional household socket. See pictures. This is urge protected through the use internally of Metal Oxide Varisitors Once these varisitors surge component's have reached their capacity, they will no longer offer surge protection. Typically this will be when a surge or spike has occurred in the mains supply; the adaptor will then have protected your valuable equipment plugged in to this adaptor. It comes with 4 adjusting screws of 2 different lengths (25 and 55mm) so can be made secure in virtually any socket. 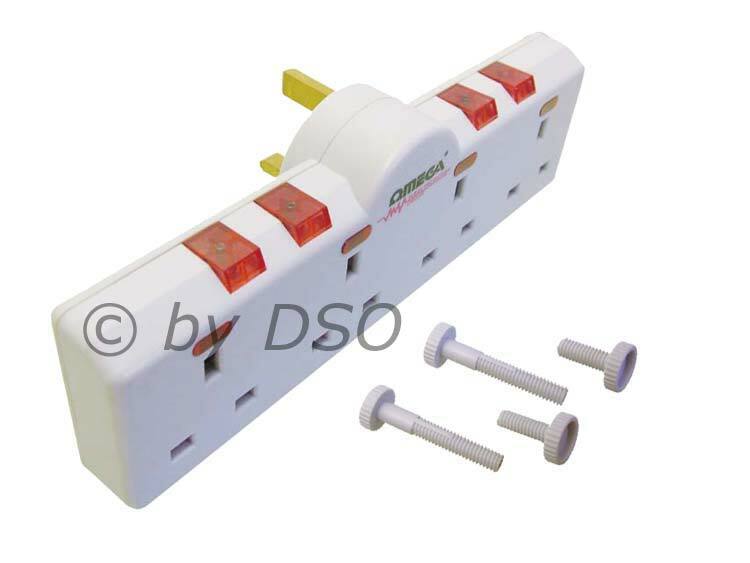 This Adapter will easily convert your mains socket into four sockets with individual switches that are surge protected. Excellent for your home and office computers and electronics. Protects against damage from harmful power surges and spikes to your computers, modems, fax machines, printers, scanners, and many other valuable home appliances.